* Trade fair slogan "Digitalization in Machine Tool Manufacturing – Implement now!" Under the motto "Digitalization in Machine Tool Manufacturing - Implement now! ", Siemens will be demonstrating to users and manufacturers of machine tools at its 270 square meter Booth B03 in Hall 2 how end-to-end... (see complete caption below). At the AMB in Stuttgart, the International Exhibition for Metalworking, Siemens will be showcasing the continuously advancing Digital Enterprise portfolio used for implementing Industrie 4.0 in the machine tool world. It helps both makers and users of machine tools to leverage the enormous potential that digitalization now offers. Under the motto “Digitalization in Machine Tool Manufacturing - Implement now!”, Siemens will be demonstrating to users and manufacturers of machine tools at its 270 square meter Booth B03 in Hall 2 how end-to-end digitalization solutions work from the machine tool right up to the corporate management level and the cloud. MindSphere, the open and cloud-based IoT operating system helps customers to leverage all the advantages of cloud-based digitalization in machine tools. Siemens Industrial Edge enables local high-performance data processing directly on the machine tool and integrates it into the relevant automation solution. Sinumerik Integrate demonstrates how machine tools are integrated into production IT, opening up all the advantages of in-factory data processing. In all the different applications and a combination of the three digitalization platforms, machine builders and machine users will have the opportunity to gain first-hand experience at the Siemens booth of how digitalization is implemented in production and what potential it opens up. With these offerings, users have the opportunity to use the complete range from classic, local data processing to cloud-based data processing to suit their individual requirements. With this unique offering, the technology company will be showcasing ways in which machine tool manufacturers can significantly boost their production flexibility and efficiency, drastically reduce their engineering input and time to market, as well as consolidating and expanding their competitive standing in the global marketplace by digitalizing their operations. The digitalization portfolio for machine users covers the entire value chain from product design and production planning through to engineering, actual production and digital services. With its holistic approach, Siemens is the only company capable of designing the real process chain of the machine user identically in the virtual world (digital twin). At the AMB, Siemens will be showcasing new applications for MindSphere, edge computing on the machine tool using Sinumerik Edge and Sinumerik Integrate. The applications were partly developed in cooperation with customers and partners. Key factors for cooperating with customers and partners include the consistency of the digital system used and the platforms’ open ecosystem. Machine builders can now apply their specific and comprehensive machine and process expertise to basic applications from Siemens and to develop and market innovative, tailor-made applications, solutions and services for their customers. For MindSphere, Siemens will be showing at the AMB machine transparency and production planning applications. For the first time Siemens will be presenting applications using Sinumerik Edge in machining and in machine analytics, including one particular app which can be used in trochoidal milling. Sinumerik Integrate will be extended to include applications which help optimize tool availability and thereby reduce machine downtimes. With the new applications for MindSphere, Sinumerik Edge and Sinumerik Integrate, Siemens is demonstrating to makers and users of machine tools alike how its integrated, consistent and open ecosystem of digital platforms is used to increase productivity in the different applications. In addition, Siemens will be launching services at the AMB which accompany customers on their journey to digitalization, starting with a needs analysis and continuing with implementation and follow-on analysis to consulting on the continuous optimization of production processes. Siemens will be also exhibiting at the AMB an array of new hardware and software solutions for its Sinumerik portfolio. The spectrum on offer comprises integrated industrial software and automation technology designed to enable machine tool manufacturers to leverage the full productivity potential of the digital factory. The latest Sinumerik 828 software release from Siemens includes new functions such as Collision Avoidance Eco or Nodding Compensation Eco/Advance which will be significantly increasing machine tool performance. There is also a new Panel Processing Unit for Sinumerik 828, which comes with a more powerful processor, a 1-GB Ethernet Interface X130 and enhanced ruggedness. Visitors to the booth can also gain first-hand impressions of the modern and efficient operating concepts of the Sinumerik range and functions that help make machining quicker and better. Showcases focusing on robotics and additive manufacturing will be demonstrating how Sinumerik is used in these promising technologies and how it can be seamlessly and efficiently integrated into innovative production environments and technologies. 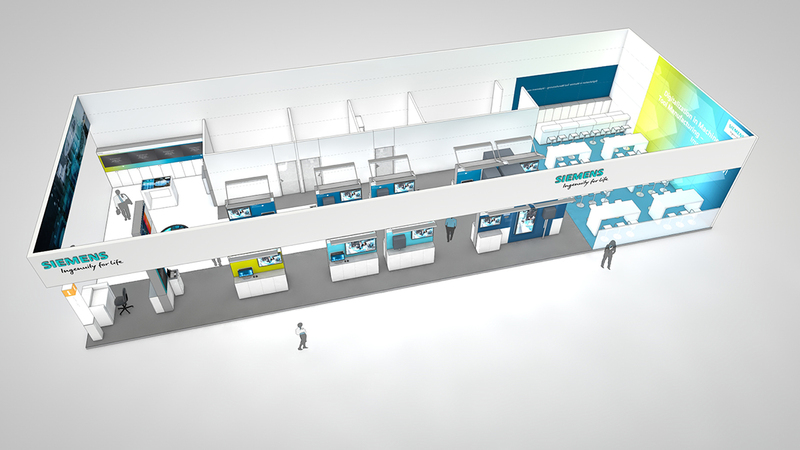 Image Caption: Under the motto “Digitalization in Machine Tool Manufacturing - Implement now!”, Siemens will be demonstrating to users and manufacturers of machine tools at its 270 square meter Booth B03 in Hall 2 how end-to-end digitalization solutions work from the machine tool right up to the corporate management level and the cloud.